Live From the Archives: Artist with a capital "A"
Dorothea Lange logged 17,000 miles on her Ford during 1936 alone documenting the despair and poverty of the South. During this early period of her life, she worked for the Farm Security Administration with the duty to document the plight of the rural poor. Yet, according to the orders of the federal government, she was not allowed to photograph white and black people together, nor photograph signs depicting segregation. Further, she wasn't even supposed to photograph African Americans at all. In fact, most people throughout the United States rarely ever saw people of color in photos; mainstream media only showed white people—and prosperous ones at that! 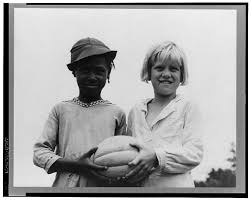 White was equated with prosperity and beauty, but Dorothea Lange would begin to change all of this. During the Great Depression, Lange documented poor whites, not prosperous ones, and African Americans in a way that made people — regardless of race and wealth — look beautiful and maintain dignity. Beginning with the 1930's and on through WWII, Lange's photographs were radical as they showed us racial inclusivity and begged for justice. As we conclude Women's History month and the 50 year commemoration of Selma, we must also recognize the greatness of Dorothea Lange who passed away fifty years ago and never lived to see Civil Rights come to fruition. Many of us may not be familiar with Dorothea Lange, but she was a local bay area photographer and the mother of several children. She worked full time throughout the '30s and '40s, even though she was disabled by childhood polio. Her right foot was withered and lacked strength, yet she carried large, heavy cameras and walked endlessly to document the lives of Americans. It's no surprise that she had a great respect and adoration for President Franklin Roosevelt, also a polio victim. Not only did Lange document transient farm laborers — her most famous photograph taken here in California's San Joaquin Valley, “The Migrant Mother” — she also documented the internment of over 120,000 Japanese Americans during WWII. She visited Byron in 1942 and photographed Contra Costa County Japanese American citizens being loaded onto buses en route to an assembly center, which used to be the fairgrounds, in Turlock. Numbered identification tags, such that one would affix to a package, not a person, were prominently pinned on each family member's clothing. The War Relocation Authority, Lange's employer, did not want any photographs that could potentially discredit the United States. Therefore, these photos of Byron, along with others that aesthetically questioned the constitutionality of internment, were impounded by the federal government and buried for years amongst random U.S. Army papers. Today, the Oakland Museum house much of her archives. Dorothea Lange was not political. She was not angry and she wasn't even a feminist. She was an artist and through the use of her camera, she asked questions that begged us to ask questions ourselves. She expanded Democracy — with the big D — and gave us all a voice to demand something better of the United States. How fitting that we should celebrate her life now, fifty years after Selma and just months after Ferguson.